Cross-section of the Heart Mountain Landslide. In this slide a 400-square-mile slab of Madison Limestone was detached, started to slide and broke into dozens of smaller pieces. Some of these pieces moved over 30 miles during the slide. Heart Mountain: Photograph of Heart Mountain, Wyoming, a klippe of Paleozoic carbonates that overlies much younger rocks of the Willwood Formation. The contact between these rock units is a slip plane known as the Heart Mountain Fault. Photo by April and used under a Creative Commons license. 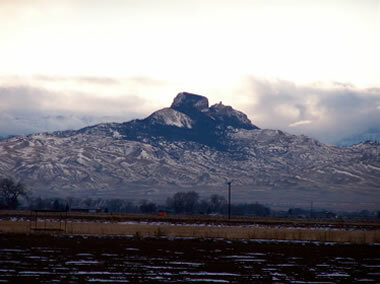 The largest known subaerial landslide is the Heart Mountain Landslide in northwestern Wyoming. Although this landslide occurred about 50 million years ago, it was so large that weathering, erosion, and volcanic activity have not yet obscured all of the evidence. The most revealing feature of the slide is a klippe known as Heart Mountain, a massive block of Ordovician- to Mississippian-age limestone that rests atop undeformed rocks of the Willwood Formation that are merely Eocene in age. The slide occurred when a large slab of Madison Limestone, about 1600 feet thick and over 400 square miles in area, became detached and slid down a gradual slope that had an average slope of less than two degrees. As the limestone slab moved, it broke into many smaller pieces. Today over 100 pieces of the slab are scattered across an area of about 1300 square miles. Some of these blocks are up to five miles across, and many of them have been buried by volcanic material. Geologists are in general agreement that a slide is responsible for scattering these blocks. However, numerous theories have been proposed to explain how such large blocks of rock could be transported up to 30 miles over a surface with such an insignificant slope. Were these blocks moved by volcanic activity, earthquakes, or simply gravity? Did the movement occur in one episode or in events that were repeated over time? This is the largest subaerial landslide that has been recognized. Much larger landslides may have occurred at earlier times in geologic history. Any evidence for these slides has either been destroyed or has not yet been recognized. 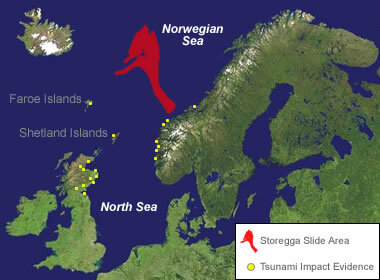 Storegga Submarine Landslide: The Storegga Slide is the largest-known submarine landslide. It occurred in the Norwegian Sea about 8200 years ago. The slide triggered a tsunami that produced significant run-ups on the west coast of Norway, Scotland, the Shetland Islands, and the Faroe Islands. Heart Mountain, Wyoming: Image of the Day, NASA Earth Observatory, February 14, 2005. The Long Runout of the Heart Mountain Landslide: Heating, pressurization, and carbonate decomposition: L. Goren, E. Aharonov, and M.H. Anders; Journal of Geophysical Research: Solid Earth, Volume 115, Issue B10, October 2010. The Heart Mountain Detachment Fault: Charles J. Hughes, Journal of Geology, Volume 78, Pages 107-116, 1970. A Self-Guided Geologic Tour of the Chief Joseph Scenic Highway and Surrounding Area, Northwestern Wyoming: Henry Heasler, Cheryl Jaworowski, Richard Jones, Rodney De Bruin, Alan Ver Ploeg; Wyoming State Geological Survey, Public Information Circular Number 35, 1996. Wyoming Field Guide: DEES Graduate Student Field Trip, Department of Earth and Environmental Sciences, Columbia University, 107 pages, 2011. Explaining the Storegga Slide: Petter Bryn, Kjell Berg, Carl Forsberg, Anders Solheim, Tore Kvalstad; Marine and Petroleum Geology, Volume 22, pages 11-19, 2005. The Catastrophic Final Flooding of Doggerland by the Storegga Slide Tsunami: Bernhard Weninger, Rick Schulting, Marcel Bradtmoller, Lee Clare, Mark Collard, Kevan Edinborough, Johanna Hilpert, Olaf Joris, Marcel Niekus, Eelco Rohling, and Bernd Wagner; Documenta Praehistorica, Volume 35, 2008. The Largest Landslides on Earth: Oliver Korup, Key Concepts in Geomorphology, article posted on the Carleton University website, last accessed August 2016. The Storegga Slide is a very large submarine landslide that occurred off the coast of southwestern Norway about 8200 years ago. The slide involved between 600 and 840 cubic miles of sediment and is thought to have occurred as a single event. The water disturbance produced by the slide generated a tsunami with significant run-ups on the west coast of Norway (30 to 35 feet), Scotland (12 to 18 feet), the Shetland Islands (60 to 90 feet), and the Faroe Islands (30 feet). The tsunami is believed to have had a catastrophic impact on people living along the coastlines. The head of the slide is at the edge of the continental shelf about 60 miles off the coast of Norway. The slide travelled down the continental slope for a distance of at least 500 miles where the topography had a slope of just two degrees or less. The western portion of the slide encountered a ridge, and that deflected part of the flow to the southwest. The slide occurred after glacial melting had deposited enormous thicknesses of sediments on the continental shelf and slope. The weight of these sediments and their geologically rapid deposition are thought to have elevated pore pressure within the sediment. The movement may have been triggered by an earthquake or failure of methane hydrate deposits at shallow depths within the sediment. Other enormous slides have occurred in this area within the past 500,000 years with an average recurrence interval of about 100,000 years. Submarine landslides are difficult to recognize and difficult to map accurately. It is possible that many larger slides will be found on the ocean floor, and many larger slides have been buried or obscured. The types of coastal areas that have a high incidence of large slides are where rivers dump large volumes of sediment onto the continental shelf. Intervals of time that have an unusual number of slides are during and immediately after significant glacial melting. This is when sea levels rise and large amounts of sediment are rapidly deposited.